In the distant past (last year) I hacked together a little toy that would allow a couple of Manager types to query, preview, and extract data from a number of MongoDB instances, to their tool of choice: Excel. I primarily created the Web based tool to eliminate the "Can you pull...." requests appearing in my inbox, and as Mac fanboys there weren't any toys around that would allow them to easily get at the data. When I say easily, the requirement was for a Manager proof point and click GUI, that could filter and flatten JSON / BSON documents with, multiple levels of nesting, into an Excel workbook. The nesting even rulled out the likes of iReports. Anyway a day or two of hacking, while sat monitoring a training session (explains the quality of the code), and I had a rough little toy (Perl CGI + JS + Dojo Grid) that offered a fairly primitive query builder, that would allow them to: Browse, Filter, aggregate and Export data from a MongoDB. Had a quiet life for a bit, till a requirement to do something similar for exported JSON files, from a couple of the Social Media sites cropped up. 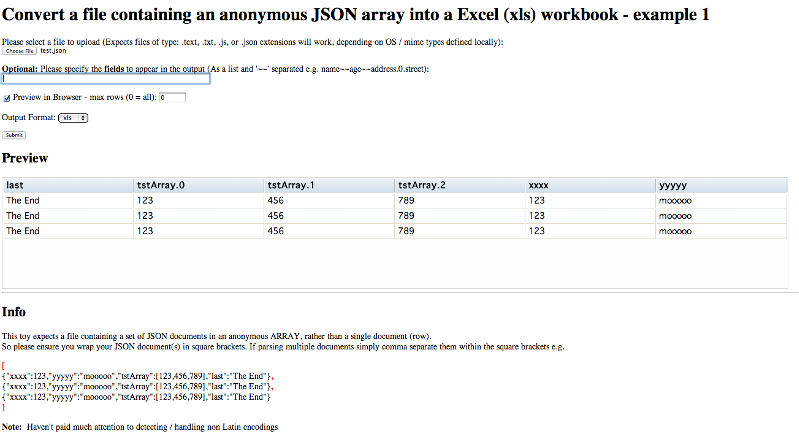 Had a quick think, simply dropped 80% of the code in an evening, and came up with a little toy that would: Upload, Preview OR Convert a JSON document into an Excel Workbook. When I say JSON document, essentially a text file containing an anonymous JSON array of documents e.g. As similar requests have cropped up on a number of the Q&A sites I though I might as well dig out the minimal version of the toy, cut it down some more, and share. Note: If you hit problems with the install first check your firewall allows you to reach ftp.perl.org. You will spend an age thinking about then probably just going for the default options, and / or installing any missing binaries (If playing on a Mac you'll need Xcode from the App store and then the Command Line tools installed, from Xcode's preferences panel). Once you have the required libraries you can have a stab at getting the simple Upload and preview / convert script running. my $sUploadDir                     = "/tmp";     # Change to suit !!!!!! The 5MB upload limit ($CGI::POST_MAX) at the top. Feel free to up or remove, as an XLS sheet can handle 65,536 documents (rows) while an XLSX format sheet can handle 2 million. The above limit is primarily a hangover from the script being stuck on a Development server, that I'd prefer not be used for bulk data processing. The $sUploadDir variable specified the directory where the JSON files are uploaded to, and the resulting workbooks are written to, per the comment alter to suit. I've externalised the Dojo includes (http://ajax.googleapis.com/ajax/libs/dojo/1.7.3/), if you want to play it may be an idea to grab your own copy, expand, and host locally. The UI or "make it pretty" Library, as mentioned above is essentially empty for this example, so simply cut and paste and create a dummy style sheet for now e.g. # Create a new workbook and add a worksheet.